Cities are experiencing explosive growth. More than half the world’s population currently lives in urban areas, and nearly 70 percent of us will call cities home by 2050. To ensure that cities reap the economic benefits of this population boom, though, research shows they need to grow up, not out. The New Climate Economy finds that compact growth, as opposed to urban sprawl, can generate $17 trillion in economic savings between now and 2050. In fact, bold climate action overall—including low-carbon growth in cities—can yield at least $26 trillion in economic benefits between now and 2030. Higher compactness correlates with lower carbon emissions. The New Climate Economy’s report, Unlocking the Inclusive Growth Strategy of the 21st Century, shows a negative relationship between number of people per square kilometer and CO2 emissions per capita. 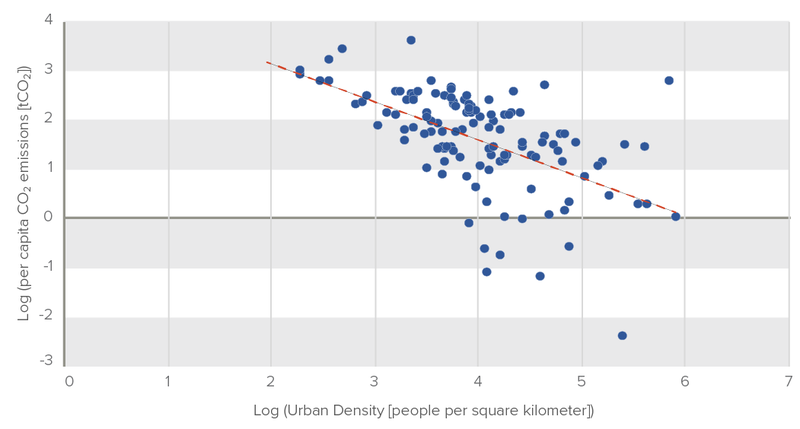 Compact cities produce fewer emissions because they tend to offer better access to public transit and cycling and walking paths, have greater energy efficiency, have lower environmental costs for infrastructure, and allow for more green spaces. Higher population and economic densities also generate major economic advantages. First, it is more expensive to construct and operate infrastructure that services sprawling communities than it is to serve compact ones. One estimate suggests that a more compact approach to urban growth could reduce infrastructure capital requirements by more than $3 trillion between 2015 and 2030. Second, people living in sprawling cities have to travel farther to reach their workplaces or public amenities. They usually face significant traffic congestion and air pollution as a result. In the United States, sprawl is conservatively estimated to cost around 7 percent of national GDP. Third, proximity encourages interactions. In compact cities, people can more easily learn from each other and exchange ideas, thereby stimulating innovation. Evidence from Germany, Mexico, Spain, the United Kingdom and the United States suggests that doubling a city’s population is associated with a roughly 2-5 percent improvement in productivity for every resident. Millions of urban dwellers live in private houses with their own gardens and private cars. Millions more aspire to this type of lifestyle. This cultural norm is reinforced by economic drivers, such as the lower cost of land around the urban periphery and tax policies that favor single-family dwellings. But once housing and infrastructure have been built, it is extremely difficult to change a city’s design. The infrastructure and urban planning decisions made today can lock cities in to carbon-intensive growth patterns. Perhaps the biggest challenge to breaking these locks is mobilizing the huge investments required to build or change transport networks. Once a city has highways, it is cheaper to extend them than to replace them with trains, for example. 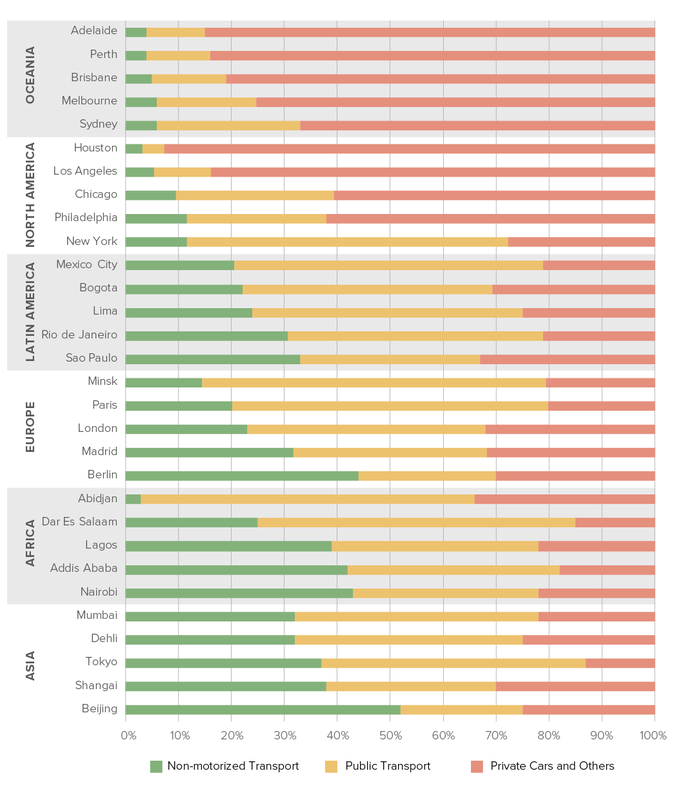 Cities in North America and Australia depend most heavily on private cars. People living in these cities consequently have very high carbon footprints. To achieve greater compactness, established cities like Sydney and San Francisco will need to find ways to move people out of cars and into other modes, like public transport, bicycling and even walking. This will involve retrofitting or replacing much of their infrastructure. Private electric vehicles might also help these cities reduce their carbon footprints, but they won’t deliver the wider economic gains associated with higher density. Fast-growing cities like Dhaka and Dar es Salaam will need to steer infrastructure investments toward more compact and inclusive growth. Building pedestrian walkways and cycling lanes for commuters can hugely reduce the risk of traffic injuries, for example, while laying the foundations for a compact, connected city. Transport investments are more effective with complementary national policies. Governments will need to reform spatial plans, building codes and tax incentives to discourage sprawl. And they’ll need to do this while avoiding the displacement of low-income or other marginalized urban residents as inner-city areas become more attractive. The next decade is a “unique use-it-or-lose-it moment in economic history,” according to the New Climate Economy report. More than $90 trillion is expected to be invested in infrastructure between now and 2030, much of it in cities. It will not be enough just to install a few solar panels, retrofit a few buildings or recycle a few more newspapers. Cities need radical structural changes to achieve low-carbon growth – and they need them soon. A version of this blog post originally appeared on The City Fix.